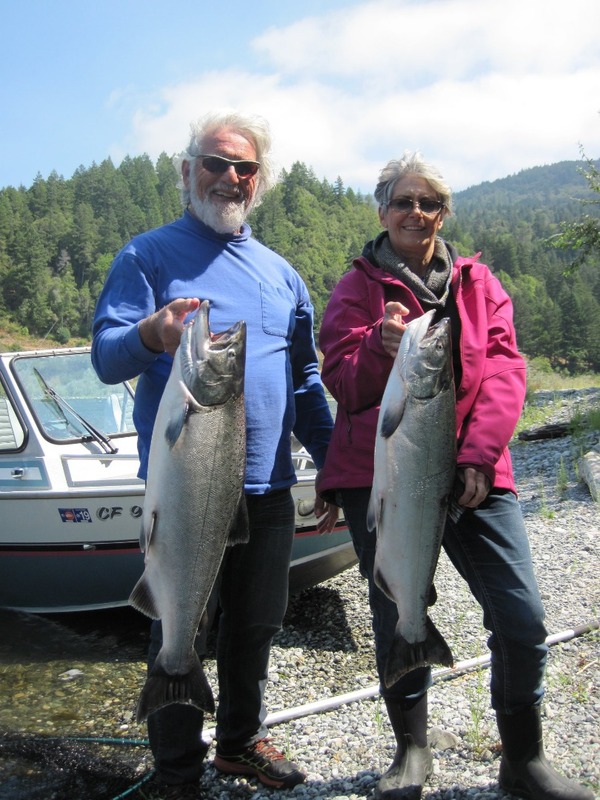 Fortuna residents William and Jody Honsal are all smiles after landing a nice adult king salmon while fishing on the lower Klamath River. The quota for adult fall-run salmon on the lower river was met on Wednesday, but fishing will remain open (with the exception of the spit area), for Chinooks less than 22 inches. Photo courtesy of Mike Coopman’s Guide Service. According to Troxel, they are seeing a large proportion of jacks, so there should be no shortage of angling opportunities in the coming weeks. “Coupling that with the high numbers of jacks reported in the ocean fishery, we have good indications for a stronger return for 2019,” added Troxel. “Coming off the full closure last year, having a successful fishery this year, and the outlook for next, it’s probably safe to say we are well into the upswing for salmon fishing on the Klamath, and we look forward to effectively managing our fishery and providing exceptional recreational opportunities to anglers who live on, and visit the beautiful Klamath River,” For more info, visit https://cdfgnews.wordpress.com/2018/09/12/lower-klamath-river-quota-met. Anglers may keep track of the status of open and closed sections of the Klamath and Trinity rivers by calling 800-564-6479. In a press release issued on Wednesday, the CDFW is reminding Trinity River anglers to return Coho salmon, Chinook salmon and steelhead tags in a timely manner. According to the release, tag return information is used each year to calculate harvest and help biologists estimate population size of steelhead and salmon runs. This information feeds into the Klamath basin fall Chinook salmon run-size estimate and informs the Pacific Fishery Management Council’s creation of regulations and quota sizes for the Klamath fishery. The data also allows CDFW to determine if progress is being made toward the goals of the Trinity River Restoration Program. CDFW will no longer be paying rewards for Trinity River tags returned from previous seasons, according to CDFW Trinity River Project Environmental Scientist Mary Claire Kier. As a reminder, anglers must immediately release all Coho salmon and wild steelhead (those with an intact adipose fin). Tags may be removed from these species, but the fish must remain in the water during tag removal. Please use scissors or a sharp knife to remove the tag. For more information on where to send the tags, visit www.wildlife.ca.gov/fishing/inland/fish-tags. The forecast looks great for the weekend. Halibut, rockfish and tuna should all be an option out of Eureka. Out 10 nautical miles, Friday’s forecast is calling for NW winds up to 5 knots with waves NW 4 feet at 7 seconds. Northwest winds to 5 knots are forecasted for Saturday, with waves N 3 feet at 4 seconds and NW 2 feet at 12 seconds. The wind will pick up slightly on Sunday coming out of the NW 5 to 10 knots and waves out of the N 3 feet at 4 seconds and N 2 feet at 17 seconds. For an up-to-date weather forecast, visit www.weather.gov/eureka/. To monitor the latest Humboldt bar conditions, visit www.wrh.noaa.gov/eka/swan. You can also call the National Weather Service at 707-443-7062 or the office on Woodley Island at 707-443-6484. 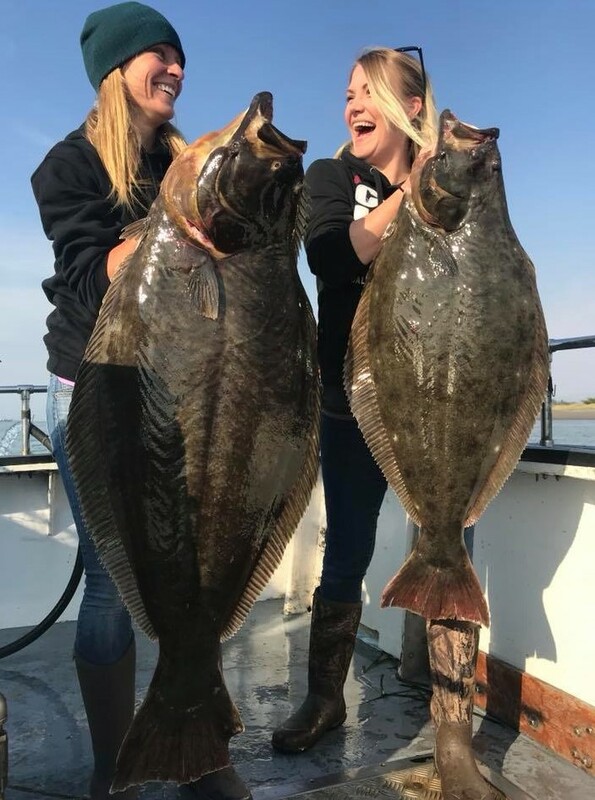 With decent weather predicted through the weekend, now’s the time to get back on the halibut grounds and take advantage of what’s left of the quota. The California Recreational Fisheries Survey has estimated that 27,024 pounds have been caught towards the 30,940 -pound quota as of September 9. A few days of good fishing could bring an early close to the season. For up-to-date harvest tracking information, visit www.wildlife.ca.gov/Conservation/Marine/Pacific-Halibut#31670772-in-season-tracking. Salmon fishing was very slow this last week reports Jake Mitchell of Sea Hawk Sport Fishing. He said, " I only heard of a couple legal fish being landed. We fished Gorda last Wednesday for halibut/rockfish combo. The halibut bite was slow and we only landed one 20-pounder, but the rockfish bit really well and we had easy limits. The rest of the week we've stayed close and fished from the whistle to the Hat for rockfish. Overall fishing was pretty slow. We fell short of limits a couple days, but we did get some nice lings up to 30-pounds." Tim Brady of Weaverville’s Trinity Outdoors reports there’s salmon from Lewiston all the way down. He said, “It’s not plugged full, but there are lots of salmon in the river. Boats pulling plugs and side-drifting bait are doing really well. There also catching a couple steelhead per trip. Not many bank anglers have showed up yet. Currently, there’s no issues getting up here and the smoke hasn’t been an issue,” Brady added.